Bonjour, or bon appetit after you read this delicious post, and welcome to Funfetti Friday! Today I am going to share all the details of a fun and delicious cake I made for a dear friend's birthday! To start out, I mixed up the Funfetti Batter, yes I know it is cheating, but I made it my own by substituting the oil for an equal amount of butter and the water for milk. This little tip will help these cake mixes taste more homemade when you need to grab that box mix and make something quick! Plus, my friend wanted Funfetti and I didn't want to disappoint! For this cake, I used two boxes, I will share why in a second! To make the base of the cake, I scooped in about a half a cup of mixture into two small round baking pans and baked them for about 15 minutes or until they sprung back to the touch- who needs timers! I baked a total of 6 small rounds and let them cool. I then leveled the layers on top and cut off the outside ring of the cakes to take away the crunchy part and leave only the most moist and delicious parts! For the frosting I used a vanilla butter cream. 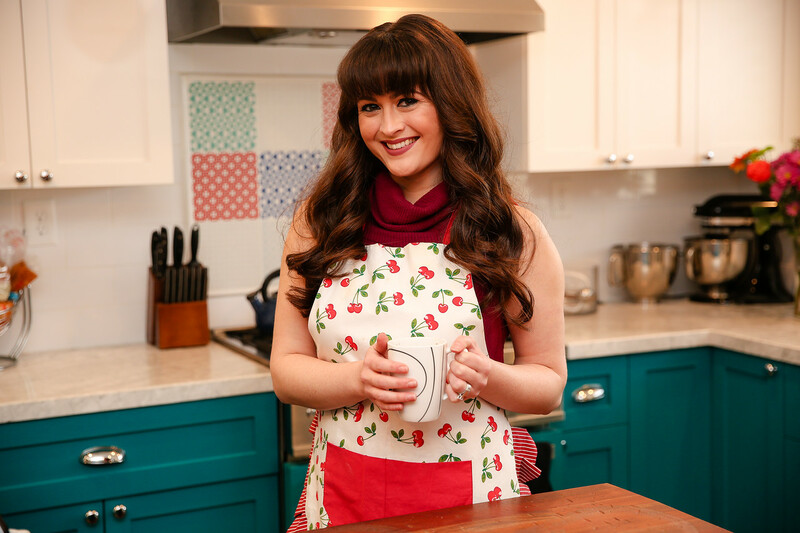 To assemble the cake, put some frosting on your tier or platter and lay down the first layer of cake, this will keep it in place. I then added a decent helping of frosting over the top and added another layer and repeated until all layers were stacked. 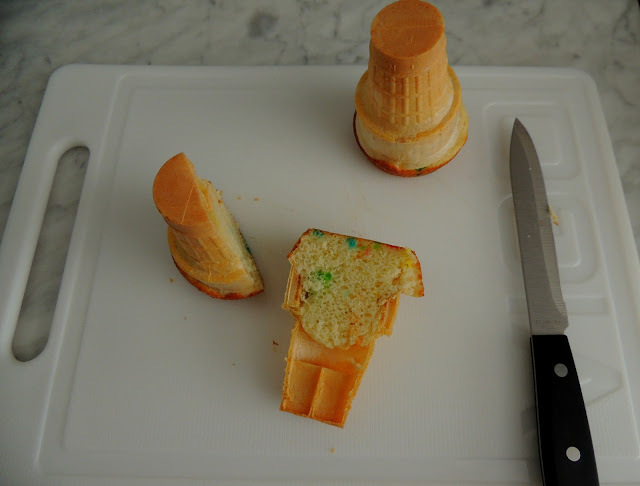 I then did a quick crumb coating of the frosting around the whole cake and put it into the freezer to keep its shape. In the meantime, I used the rest of the batter to bake ice cream cones that I cut in half to add to the cake. 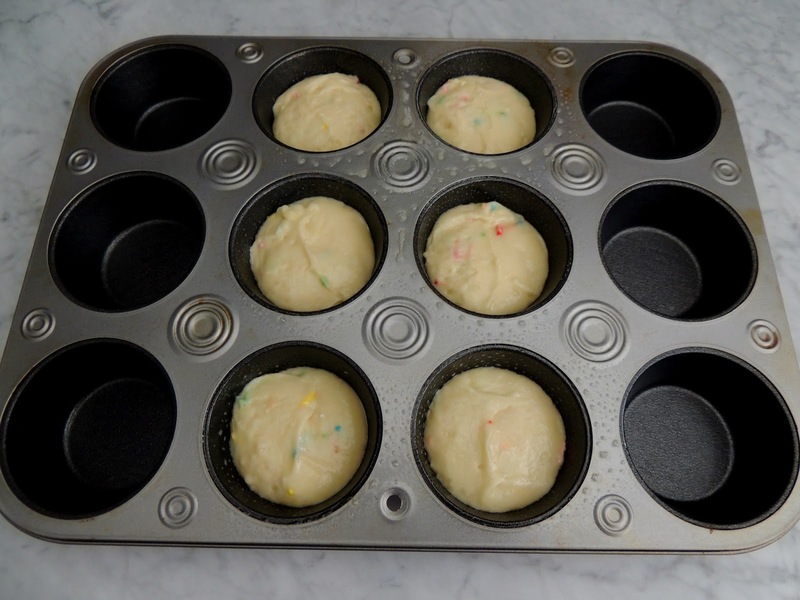 Start by spraying your muffin pan really well with non-stick spray. I added a scoop of batter in each muffin crevice using a scooper. 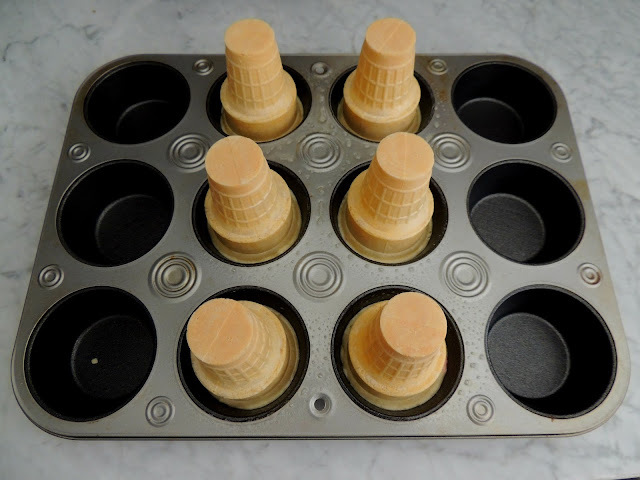 Top the batter with an upside down ice cream cone and press down a bit. The batter will bake into the cone! Whoa- Funfetti magic, right? I baked these for 15 minutes as well and let them cool. I then took a long sharp knife and cut them in half very slowly and delicately to ensure that I didn't crack any of them in the process. Who knew how much I could baby a little cone! I then removed the cake from the freezer and added a little bit of frosting to the cut side of the cones and stuck them all around the cake, It was like watching a magical Funfetti carousel being created! 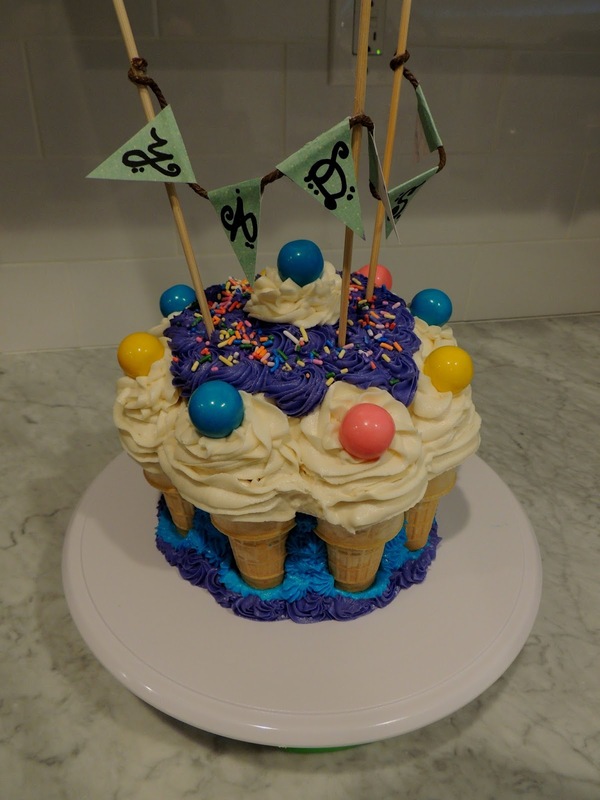 I then filled in the open spaces with colored butter cream and pipped white frosting over the ice cream cones. I topped the cake and the cones with gum balls for some extra fun as well as added some more sprinkles. I also made the fun banner on top using twine and colored paper that I glued to three long bamboo skewers. It helps make it extra special and personalized as well as give the celebrated person a little something to keep to remember their own Funfettification! So what did I do with the rest of the cake cones you ask? 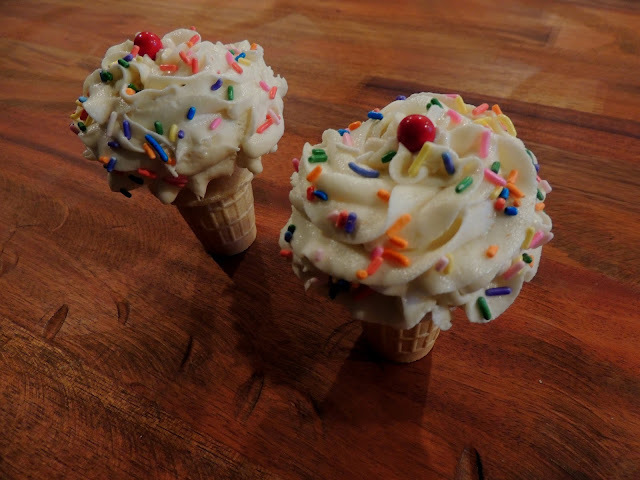 I made individual ice cream cones using the rest of the white frosting and adding some more sprinkles! If you have an event, you need to make these adorable and portable treats! They keep and carry well! Just follow the instructions above and you will be the neighborhood ice cream person in no time, only better!! Please just promise me you will play Zip-A-Dee-Do-Dah over a loud speaker to let me know you are approaching the neighborhood! Thanks for joining me to get your Funfettification on! Please share with me your own Funfetti traditions so I can try those out as soon as possible! I hope you will join me tomorrow for the last day of my first blog mini-series- Stuff on a Stick Saturday. Have a very Fun[fetti] Friday, friends!